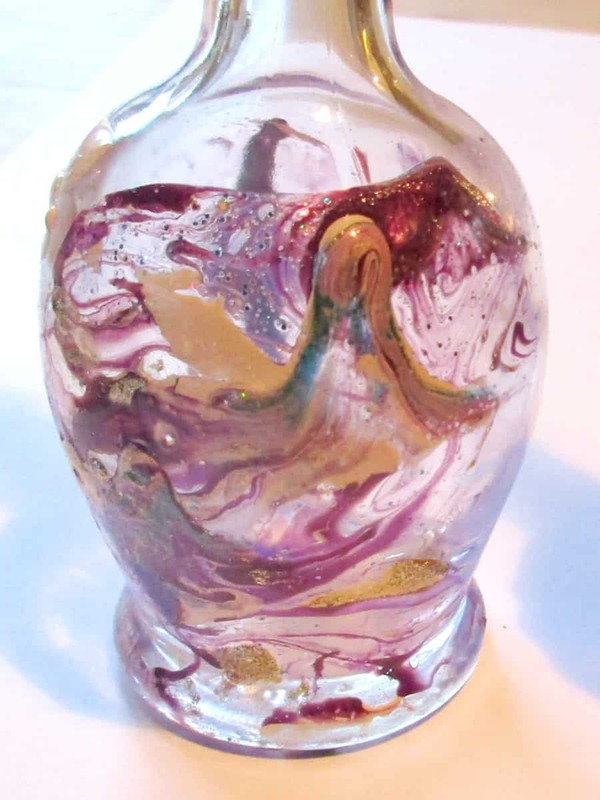 The inspiration for this project came from all the beautiful images on Pinterest of marbled fingernails. We used a selection of old nail polishes that I never wear. Commonsense would suggest that newer nail polish would be thinner, giving the best result, but I just hid the ones that I love, and let the kids choose from the rest. Before we started, we also planned how we would dry the bottles. Our solution was pencils stuck into an old floristry oasis, anchored into a pot. 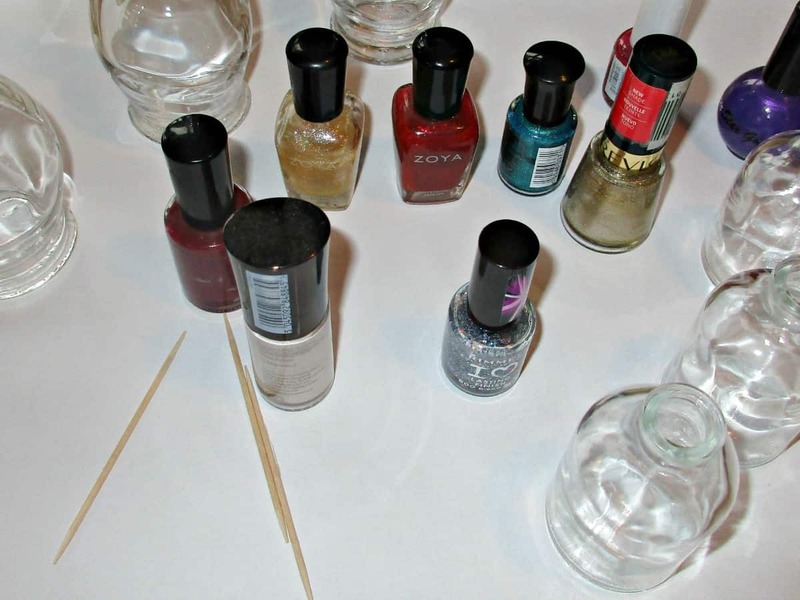 Use warm tap water, and gently drop the nail polish on to its surface. If you just tip it in quickly, it may sink to the bottom, so use the brush held just above the water to control the flow. 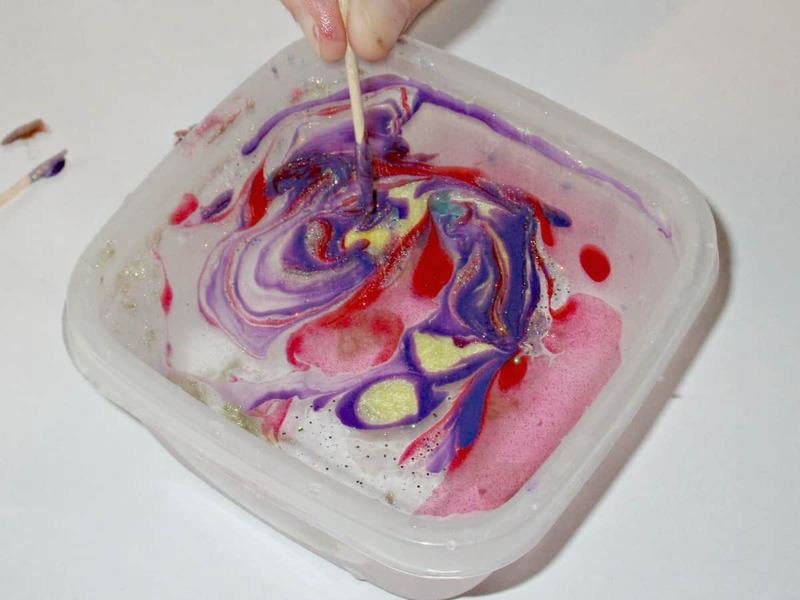 Once you have added your choice of colours, use a cocktail stick to mix them up to get a marbled effect. 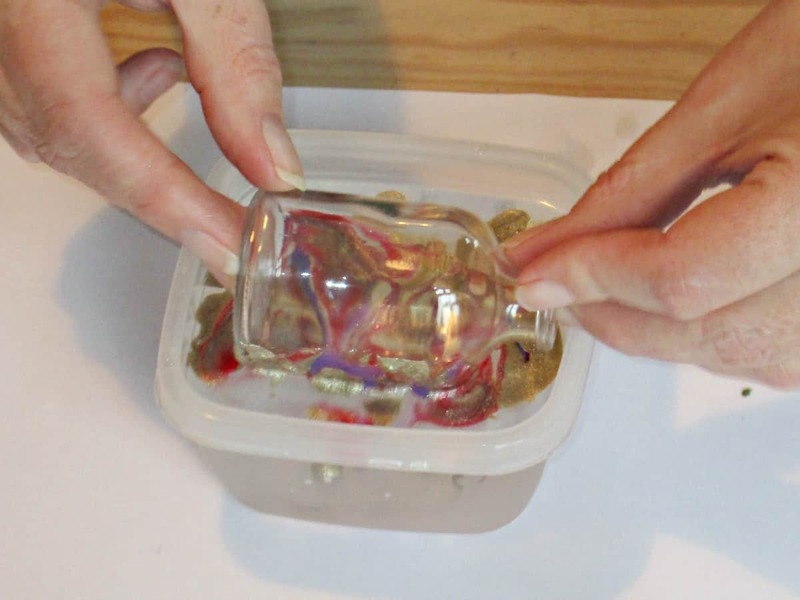 Use a container that you don’t mind ruining as it won’t be easy to clean when you finish. 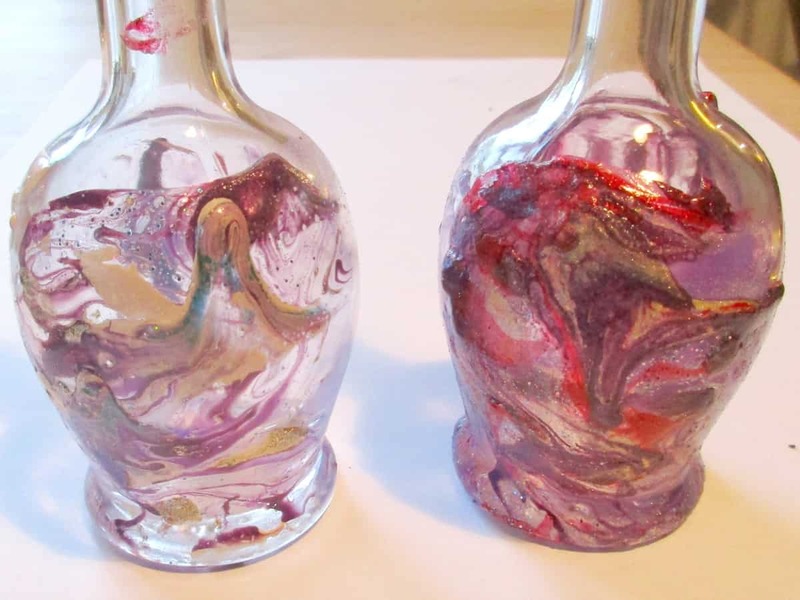 Pop the sides of the bottles into the water and turned them gently. 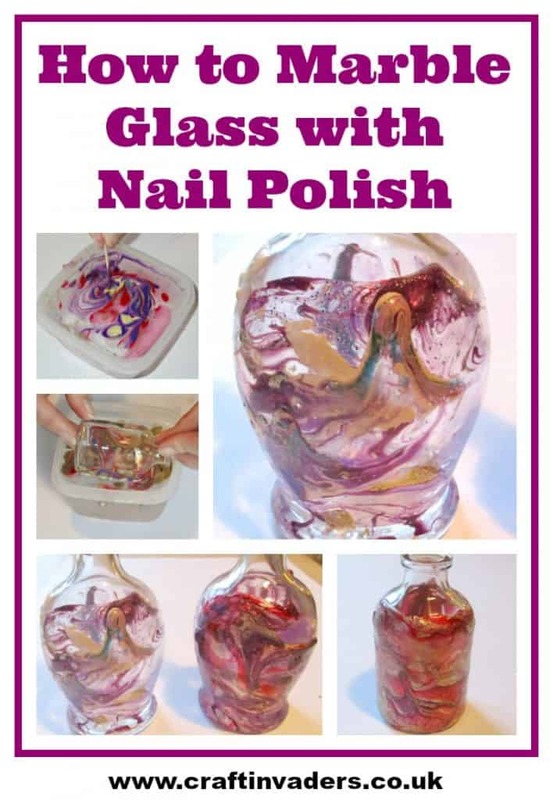 The nail polish grips the glass immediately, so you will find that all the nail polish from the surface of the water clings straight away. If you try this technique with larger objects, you may have to go through the process more than once to cover it all. Leave the bottles to dry. Once dry you can remove any smudges using cotton wool and nail polish remover if you wish. The polish is tough once dry, and these bottles hand wash happily. If you’ve enjoyed this tutorial and fancy checking out some more of our recycled craft ideas, why not take a look at our Recycled Magazine Basket and Pretty Pocket Purses. I love this idea, and the end results. It’s a pretty impressive craft which older children would enjoy (I’m always looking for these! ), and would make great gifts for grandparents too. I think we might try it on wine glasses. These turned out amazing. I have to try this! Great way to use up old nailpolish too. 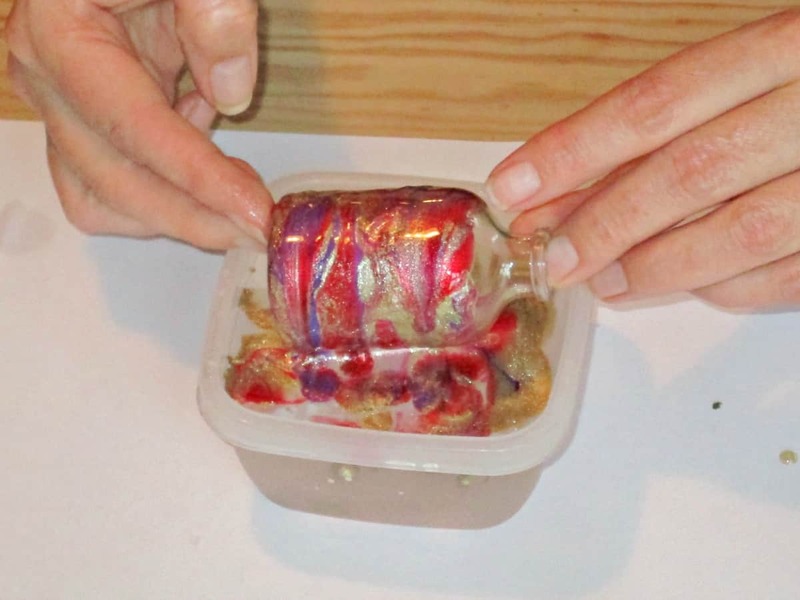 Its a brilliant way to use up old polishes. I have an 8 yr old daughter so we have all sorts of weird colours in the house that she has persuaded me to buy in the past, and then sanity kicked in I realised I’d never wear! Be perfect for that. We make all our Christmas presents now, and everyone always seems really pleased with them – who doesn’t enjoy a few treats! We’re so excited to have been featured on #Letkidsbekids – thank you! Popping back, I really am going to have to try this. Sarah, I had never seen this before, love it! My daughter has a bajillion bottles of nail color that she doesn’t wear anymore, perhaps she’ll let me have them! LOL I’m sure I paid for them in the first place! Thanks for the step-by-step!!! These are fantastic, I love that you can mix lots of different colours together for them. They will look lovely with LED lights in at the window, I can imagine the colours would be quite vibrant like that. However I need to buy some nail polish for this project as I don’t actually own any! Hi Sarah, how clever. 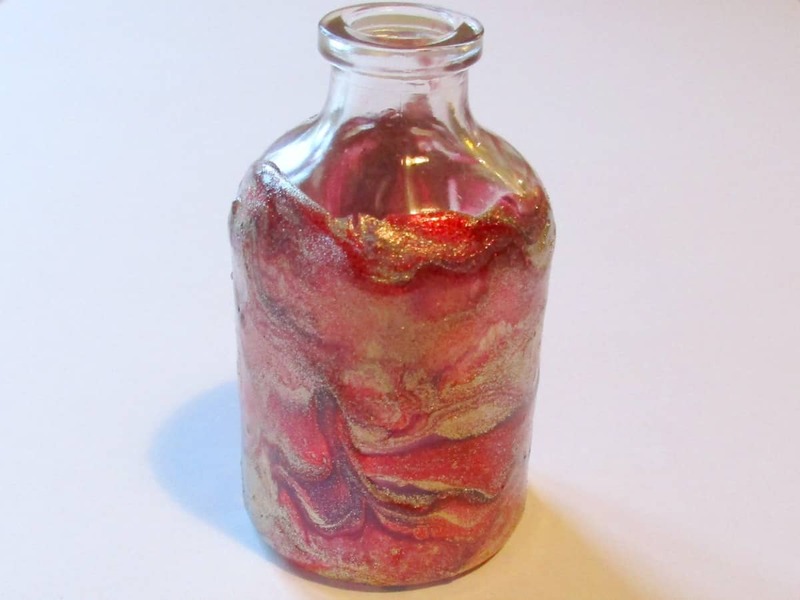 I’ve seen how they marble nails in this way, but would never have thought to try it on glass bottles. I think you’re right it would look pretty on a tealight candle holder and with Christmas not too far off, that’s given me some ideas. Thank you.